The Rise-X Pro is a solid performer on any desktop-providing the perfect foundation in transforming your work area into a sit to stand active office environment. Thanks to a gas-spring assisted lifting mechanism, height adjustments are smooth and require little effort. Ease and flexibility are truly at the heart of the Rise-X Design. There's plenty of room for your keyboard and mouse, and the rear of the workstation accommodates a single or dual monitor mount. Best of all, the Rise-X Pro is quite possibly the most affordable desktop converting sit stand workstation in the market today. Your search is over, you just found the Rise-X Pro. Ergonomic Design: Built with gas springs, this adjustable desk riser easily transitions from a seated to standing position as you work, resulting in improved posture and comfort while typing. 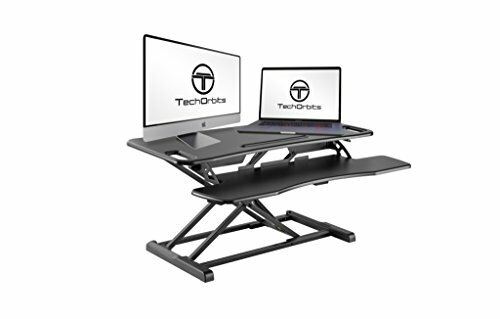 Raise Your Workstation: At almost 38" in width, this ergonomic desk converter has plenty of space for all of your devices, allowing you to raise your entire dual-monitor workstation to a more comfortable height. Built To Last: A practical way to revolutionize your workstation, this durable stand up desk is built to support up to 33 lbs of gear, including your monitors, laptop and keyboard. Easy Installation: This adjustable standing desk simply sits on your existing desk. A pre-set grommet hole allows for simple installation of an external monitor mount for heightened capabilities. Protect Your Desk: Featuring non-skid silicone pads on the base, this stand up desk converter can be placed on virtually any flat surface or desk without slipping and sliding or leaving scratches. If you have any questions about this product by TechOrbits, contact us by completing and submitting the form below. If you are looking for a specif part number, please include it with your message.